A while ago now I interviewed Fed Fornicola. Amid what often becomes impenetrably dense arguments in the HIT training field, Fred is a voice of simplicity and strength. Things do not have to be as complex as we often make them as we geek out about training (e.g see this thread over on the Body By Science blog - even I join in!). Fred keeps things simple - train hard, train safe, recover and go again. The book doesn't go into the long descriptions of exercises that often fill up training books. It assumes that you know the exercises or that you can find out how to do them (This is the age of google and YouTube! There are some pretty decent sites ou there now that show how to perform most moves). Rather this book offers information on training techniques and enough routines to keep you going for years, whether your goal is conditioning or muscle (it is all the same in the end). Recommended if you are looking for some inspiration and new ideas. Sometimes rather than working out your own routine it is nice to relax with something that has been planned out for you. Pick some of the ideas in here and stick to them for a few weeks. The book covers a number of total-body and split-body workouts along with specialized routines and the ever challenging “3 by 3″ workouts of which we have quite a few. 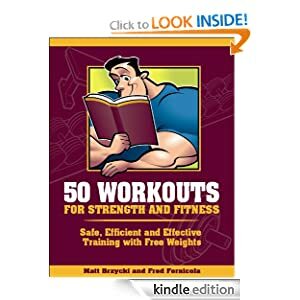 The workouts in this book are designed to be done with free weights. For these purposes, free weights include barbells, dumbbells and bodyweight. Some of the workouts will specify a particular type of free weight. However, because you might not have access to a specific type of free weight, most of the workouts will simply note the names of the exercises. You can choose what to use based on availability, convenience, preference and safety.